I’ve been extremely busy the past couple weeks, teaching classes and working various events, that I’ve barely been online. I feel terrible but, after the end of this coming week, should have a few days to relax. I’m sorry to those whose posts I’ve missed. I promise to get to all of them this week. Today is my husbands birthday – he insisted I don’t make him dessert. Of course, he knows who he’s dealing with. I can’t ever go without making some sort of birthday cake or pie when I’m celebrating someones birthday that I love. While vacationing in Colorado over the summer, we frequent the Breckenridge Brewery, a bar and grill that has tasty grub, I guess you’d say. 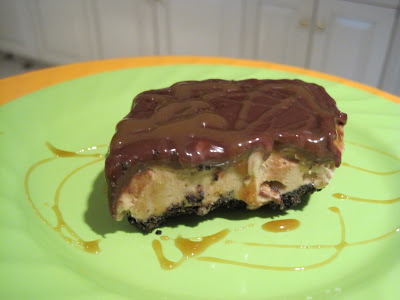 One of my husbands favorite items on the menu is their Mud Pie, an ice cream pie dessert. So in an effort to recreate it, I also made a few changes from the typical ones you may have had. My husband loves Oreo’s, Heath Bars and chocolate fudge so I decided to make my Mud Pie to include all those ingredients. I made mine in a 9×13 plastic container, mainly so we could have smaller bites. However, I think a pie pan would be ideal and give thicker, heartier slices. He wasn’t thrilled at first when he saw I made this, since we’ve been overloaded with birthdays and sweets lately. None the less, he did enjoy every bite he took. Mix melted butter and oreo’s together; pat into a 9×13 inch pan or round pie pan. Place in freezer until cold. Soften the ice cream. I do this by placing it into a large bowl and stirring. It softens quicker. Mix in Heath Bar pieces. 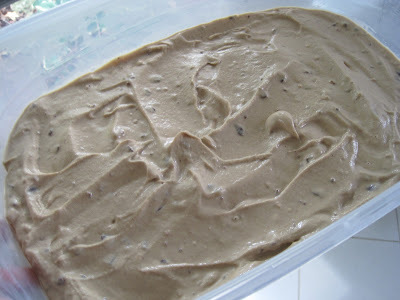 Spread softened ice cream mixture over cold crust. Return to freezer. 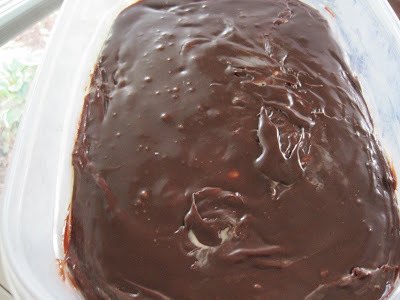 Melt butter and chocolate chips in saucepan over low heat. Stir in evaporated milk and powdered sugar. 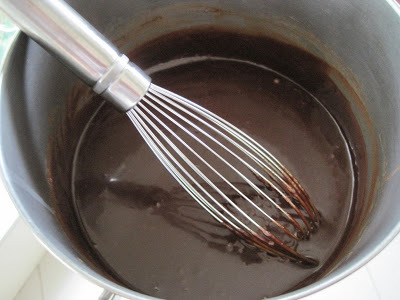 Cook stirring constantly with wire whisk or wooden spoon, until mixture thickens. Remove from heat; stir in vanilla. Set aside to cool until room temperature. 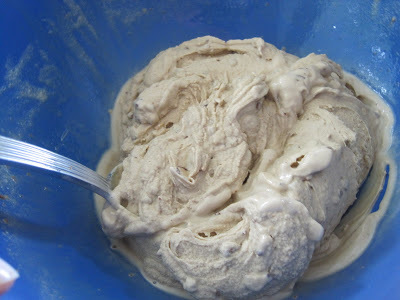 When ice cream in container has hardened, pour cooled sauce over top and spread to cover edge to edge. Cover and return to freezer and chill. Cut into squares to serve if using a rectangular pan. Otherwise if using a pie pan, cut into wedges. Drizzle with Caramel Sauce and Serve. Happy Birthday to your husband, he is one lucky man to have you as a wife to make this scrumptious pie, I just love this kind of pie… one of my favorites for sure~! Happy Birthday to your husband! What a fantastic birthday treat! After all the birthdays we’ve celebrated lately and all the huge cakes I’ve made this one sounded perfect and it was. 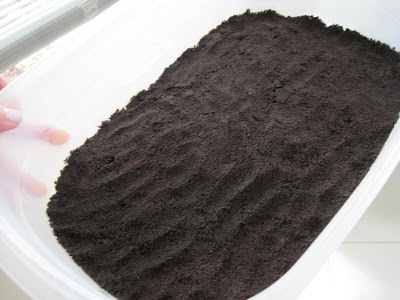 I love mud pie and this recipe sounds so yummy. I love the way you present food. Delicious!! Vicki, thanks again for the award. Shall be acknowledging you in my next post. Mmmmmm…I know this would be perfect for all b-day celebrations at our house! YUM! I don’t think I want to wait until someone around me has a birthday to make this lovely dessert! Your husband is one lucky guy because you made this for him despite his protests. I do believe that after all these years, he’s still playing hard to get ;-). Happy Birthday, Mr. Bensinger! I’ll be sure to tell my husband that all my blogger friends wished him a happy birthday. After a few days with the dessert and just the two of us empty nesters to eat it, he asked if I would mind him taking the dessert to our neighbors. I said that was fine and they were thrilled! He is trying to watch his waistline. I’m on a diet! I can’t be looking at this!